Where in Walt Disney World has become my go-to Disney app (move over Words with Friends and Draw Something)! 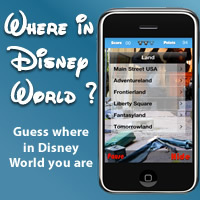 It really is tons of fun and the perfect app for a Disney Parks fanatic! The concept is simple, you are shown a picture of a place in Walt Disney World and you must identify where the picture came from! There is a running total of points you earn for correct answers and the app is expanding. Your initial download includes all lands of the Magic Kingdom (with over 600 photos) and you can download the Epcot expansion from within the app (with double the pictures to play as the Magic Kingdom section). The developer has noted that future expansions with Hollywood Studios and Animal Kingdom are planed. You can navigate your way through the app quite easily by having a quick game or choosing which Land to visit directly from the homescreen. Where in Walt Disney World was developed by PowWows.com and is brought to you by Where in Disney World?- check them out on Facebook! Like the other Where in Walt Disney World apps it is under a dollar. You have to pay for the Epcot expansion as well but in my mind you will end up getting all 4 parks at some point for less than $4 so it is still worth it. This is one of those great "road trip" apps where you can keep yourself, your friends, and your family entertained for hours!